Sometimes you just have make something a little different. One of the things I love about making knives is...pretty much anything is possible. Here are some of the examples of things...well...you know. This full-tang scalpel is just under 1/16" thick and forged from 397 layer high carbon damascus steel. The design is from an antique scalpel a friend loaned me with a main cutting edge (1 3/4") and a small, broader half-blade (7/8" cutting edge). The contoured handle scales are premium African Blackwood and are secured with three stainless steel pins. Overall length is 6 3/8". These letter openers are forged from common HC railroad spikes. The blades have roughly a 4 3/4" cutting edge and are brush satin finished. The twisted handles are acid/forged finished with the rises on the twist and the spike head itself mirror polished. The stands are acid etched metal discs with rough forged rods to hold the spikes upright and a small leather pad to protect the tips. Here's another somewhat off the beaten path. 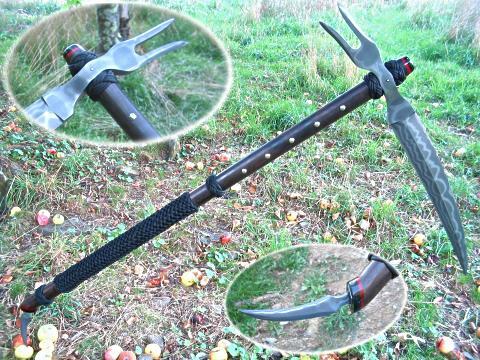 This sickle has a double ground blade and fork of pattern welded steel about 22" from tip to tip. The 5" bottom spike is from the same billet. The shaft is 3' of Ebony with para-cord wraps/knots, stabilized Buffalo horn end caps with Red Jasper spacers and nickle "hob-nails". The shaft eye has a domed, stainless steel set pin. 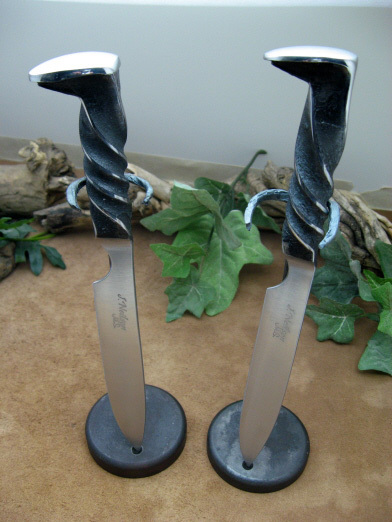 My "Shoe" knives are actual horseshoes cut in half with acid etched, forge marked 1084 blades forge welded into the cut. 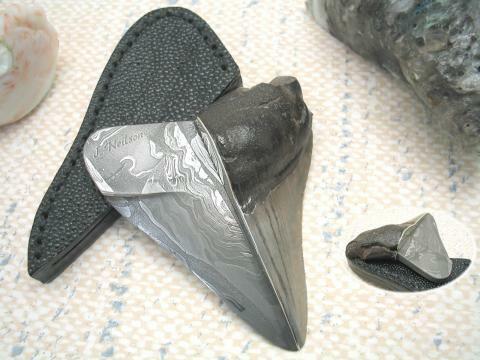 The other end (tip) of the shoe is split and scrolled. These knives come in right and left handed and normally have blades between 3"-4". All come with tooled leather belt sheaths. 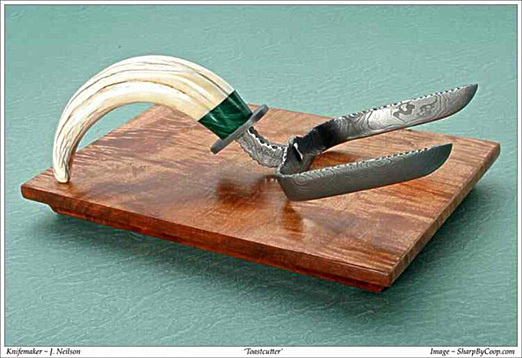 This knife is best known for it's use after the Civil War as an eating utensil for those soldiers who had lost a hand/arm in combat, acting as both a one-handed knife and fork. 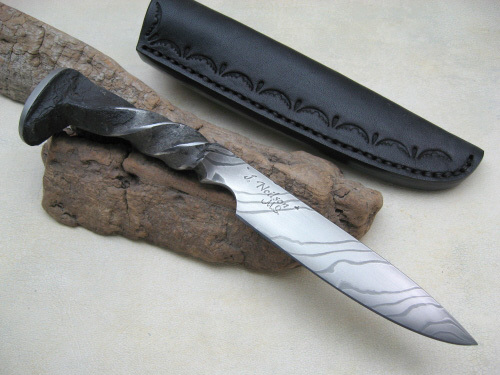 This knife was made from 52100 steel with a hand-rubbed finish. The handle is Desert Ironwood Burl with black liners, stainless steel handle bolts and lanyard liner and a matching Ironwood fob. 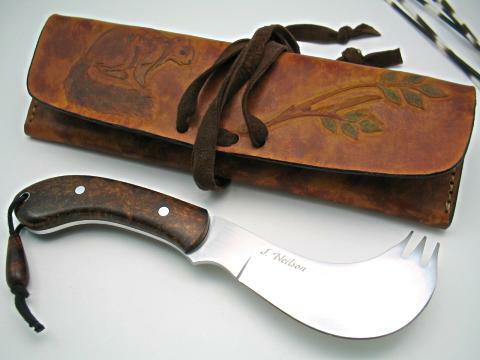 The knife comes with a carved leather case with a "woodland squirrel" motif. This spike knife is a little different. It is an old spike that was stamped HC on the head and has a fine grain of it's own in addition to the added L-6 steel in the blade's twist. The blade (sharpened area) is 4", 9" total length. The rises on the twisted handle and the spike head are polished then etched. I always loved sharks as a kid along with knives so.. why not combine the two. 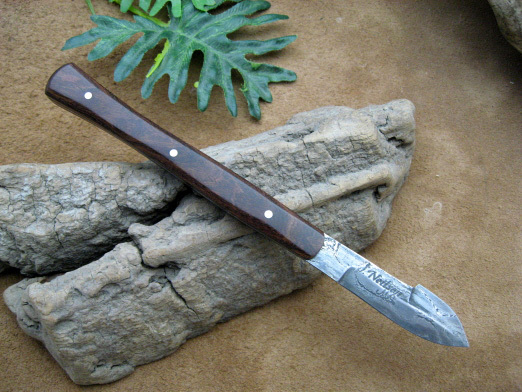 This knife is fashioned with a fossilized Megalodon shark tooth. The blade side of the knife is done in "Frontier" damascus with a nickle- silver guard dividing the two parts. The blade is convex ground and contoured to match the lines of the tooth. 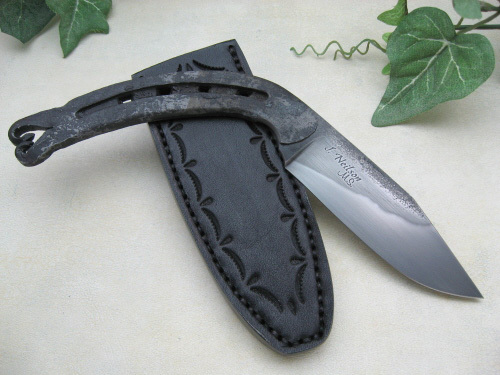 The sheath is stingray skin with a magnetic (rare earth) inlay to assure a secure, solid hold on the blade.